The 12 gauge was was invented in its semi-modern form back in the 1870's and is still one of the best close range hunting rounds available. Now used by law enforcement professionals, military personnel, hunters and sports shooters alike, the 12 gauge is a very versatile round, great for several shooting applications. 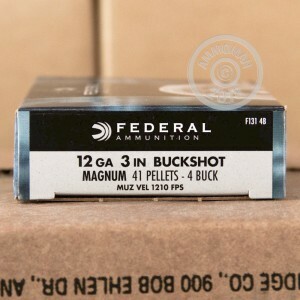 Founded in 1922, Federal has been filling America with high quality ammunition for years. As one of the most trusted and loved ammunition companies in the States, Federal ammo has a reputation for being reliable and consistent. 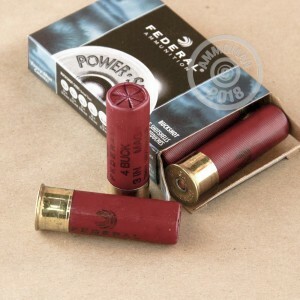 With these Power-Shok 3" shells you are set for hunting or self defense applications. Each hull carries 41 pellets of #4 buckshot that are hurled at a muzzle velocity of 1,210 feet per second. Don't forget, at AmmoMna.com all orders over $99 ship for FREE, so stock up and save!